I met Kara through The Better Mom where we both are contributors, and we are so like-minded about many things … including adopting kiddos. Kara shares wonderful info on Bible Reading plans. (Key word on “plans.”) I know you will be blessed! “Careful planning is part of what makes a person wise and productive. Not to plan is considered foolish and dangerous. This is true even though the Proverbs teach that we do not know what the future may bring. ‘A man’s mind plans his way, but the Lord directs his steps’ (Proverbs 16:9). The fact that the Lord is ultimately in control of the future does not mean we shouldn’t plan. I am convinced that not much happens without a plan, so I’m sitting down to look at our Bible reading options for this upcoming year. In the past we’ve gone through many different outlines and recently have been enjoying writing out different passages. 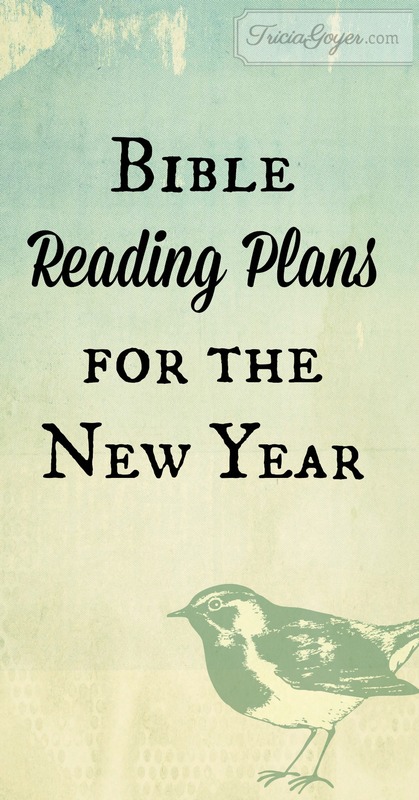 But the new year offers a great opportunity for a fresh start and a solid attempt to daily read through the Bible. Crossway offers ten different ESV reading plans (each available in multiple formats). Several years ago we went through Ransom Fellowship’s Read Through the Bible Plan for Shirkers and Slackers. The M’Cheyne reading plan includes reading through the Old Testament once and the New Testament and Psalms twice. Ligonier Ministries also offers several free, printable Bible reading plans. Last year we completed their 5X5X5 which has you reading through the New Testament 5 days a week. It’s a great one to start with if you’ve never consistently read the Bible or if like me, you appreciate a slower pace and time to focus on a passage or book of the Bible. Bible Gateway offers many subscription options as well (for free), including the daily audio Bible. If you’re just getting started reading the Bible, one of Back to the Bible’s Challenges might be the way to go. They offer several options (21 day, 90 day, 6 months & 1 year challenges). The Navigators’ Book-at-a-Time plan will take you through the entire Bible in a year with 25 readings per month (which allows for several “catch up days” if needed). I also really enjoy going through some sort of daily devotional. May God bless our desire to be intentional about spending time with Him in His Word this next year! I have read the Bible through many times and I always learn something new each time. Every time I read Revalation through it becomes a bit clearer. Still so much I don’t understand about this book . Last year I read The One Year Chronological Bible put out by NLT. This was my second time reading this version in chronological order. I enjoyed it very much. My church usually offers plans to help people read the Bible daily. This year non has been offered that I know of. So I’m following the plan set up in the Sunday School lifeway quarterly and as I study my lesson I dig deeper in to the Bible as I follow prompts to different scripture verses that corresponds with the part of the Bible we’re studying now. At present we are on Ezra. Thank you for sharing all these different plans to read the Bible. It does help me to read it first thing each day. I have your book Amish Peace. Love it. I have never practiced this tactic, many thanks for conveying it.